It has always been a major priority for Raptor Rescue to promote high standards of care and responsibility for the treatment of injured and sick Birds of Prey. Changes to the Wildlife and Countryside Act prompted the Raptor Rescue Trustees to become the first organisation concerned solely with birds of prey to establish such written standards. 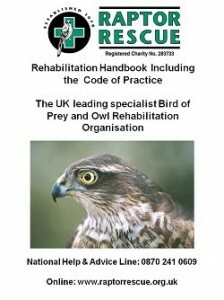 After extensive consultation with active rehabilitators, carers, avian specialists and veterinary advisors, both from within and outside Raptor Rescue, the Charity published the first Guidance Notes and Code of Practice for Raptor Rehabilitators that set out minimum standards and working practices. The initial 36-page booklet published in 1999 was welcomed by all people and organisations involved in work with wild raptors; so much so it has required a number of reprints and each time it has been reviewed, updated and revised. 2008 saw the introduction of the revised Rehabilitation Handbook and Code of Practice which has been brought up-to-date with current legislation in 2011. It has been produced in consultation with Defra, Animal Health, Scottish Government, Welsh Assembly Government, Northern Ireland DOE, RSPCA, SSPCA, National Crime Unit and Police Wildlife Crime Officers. This complete handbook includes vital information for birds of prey and owl rehabilitators with chapters on facilities, husbandry, casualties and legislation. A number of useful forms are included and these can be downloaded for individual use. The information can be accessed below; it has been split into its various sections for ease of reference. Please Note: The guidelines we issue are advisory only and have no force of law.